In September, John Leese converted the showroom that onced housed his Hummer dealership in Grand Rapids, Mazda Motor Corp. Mich., into a Thrifty Car Sales used-vehicle store. John Leese, owner of Cadillac and Lexus dealerships in Grand Rapids, Mich., says he always wanted to sell nonluxury late-model used vehicles but could never attract those buyers, even with aggressive advertising. So in September he opened a Thrifty Car Sales used-vehicle store in his former Hummer dealership showroom. The store's former service drive houses Thrifty Car Rental, whose inventory will cycle into Leese's used-car inventory when it is retired from the rental fleet. Leese says the economy has created demand for mainstream used vehicles. He hopes the Thrifty brand can help him become a player in that arena. "Now we can cover all income brackets," says Leese, whose used Cadillac and Lexus vehicles sell for about $25,000. "This is better than opening it on my own. Thrifty has a national brand presence; they are a well-run company, trustworthy, and have a good reputation with the public." Many franchised new-car dealers have operated separate used-vehicle stores for decades. But with the poor economy and a slow recovery in new-vehicle sales, there is a heightened interest in stand-alone used-vehicle operations backed by national brands. 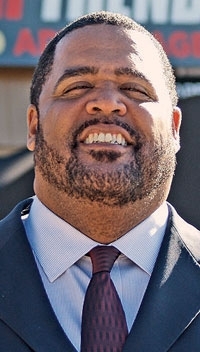 Steve Ewing: Ford can't give him all the new cars he wants, so he opened a Motor Trend used-vehicle store in suburban Atlanta. Dealers are looking for ways to use empty buildings that once housed domestic brands or to fill voids in their business models, says Scott Lilja, vice president of member services at the National Independent Automobile Dealers Association. Branded used-car operations fill the bill. About 8 percent of NIADA's members operate new-vehicle dealerships in addition to their used-car stores. On Oct. 7, Steve Ewing, owner of Wade Ford in suburban Atlanta, opened a stand-alone Motor Trend Certified Advantage used-vehicle store across the street from his dealership. It offered an established reputation, national exposure, employee training and vehicle warranties. In addition, Ewing says he is cranking up his used-vehicle business because Ford Motor Co.'s reduced production -- part of a new business model that promotes profitability at a lower volume -- is curtailing Ewing's ability to get as many new Fords as he wants. The Motor Trend brand allows Ewing to fill that gap by certifying used vehicles of any brand that are up to 8 years old and have fewer than 80,000 miles on the odometer. The Motor Trend brand also carries a variety of warranties that start at 6 months/7,500 miles. Ewing says used-vehicle sales are profitable, his used-vehicle store gives him control over what he sells, and that the Motor Trend name is a third-party endorsement. "Growth is in the used-car business, and it has a positive effect on parts, service and my body shop," he says. Last year AutoStar National Dealer Network, a fledgling group of used-car stores, and Driven Brands, the parent company of Meineke Car Care Centers and other aftermarket service brands, separately began recruiting owners of rejected Chrysler Group and General Motors Co. dealerships to take on their brands. This month the two companies joined forces to offer branded combined used-car dealerships and service operations. Ken Zangara, AutoStar COO and a former Dodge dealer in Albuquerque, N.M., says the two brands complement each other. "They're really strong in the back end, and we've got great systems for the front part of the store," Zangara says. Three of the seven AutoStar stores are owned by dealers with new-car franchises; three of 14 pending stores will be operated by franchised new-cardealers as well, Zangara says. About a third of Driven Brand's 18 operating and seven pending dealerships are or will be operated by dealers with new-car franchises, says Jim Evans, senior director of the company's Jump Start program. 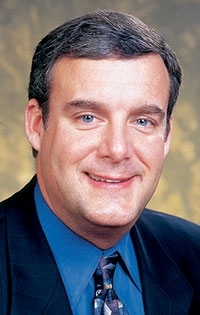 Terry Sands, president of Sands Auto Group in Allentown, Pa., says he will open a used-vehicle store under the Sands name paired with a Meineke center in his Chevrolet dealership when it closes at the end of this month. 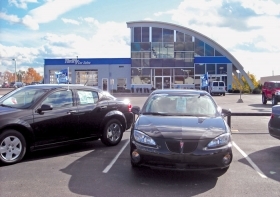 The family-owned auto group also operates two Ford dealerships, a Chrysler-Dodge-Jeep dealership and a Suzuki dealership. Sands adds: "We're looking to enhance our overall used-car operation by having a name-brand service department."